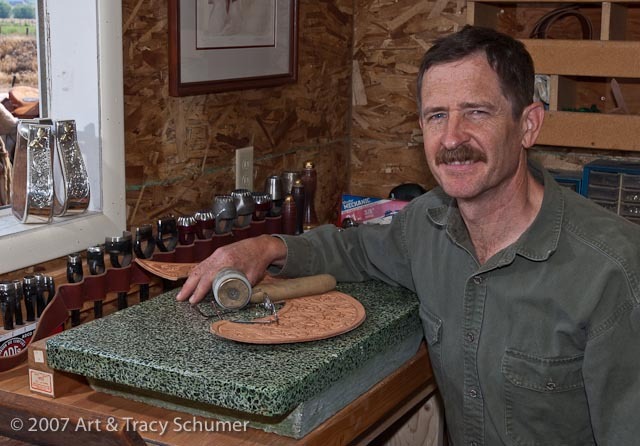 Cary Schwarz began working leather as a hobby in the early seventies as a farm boy from Southern Idaho. 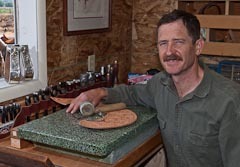 Later that same decade, he visited a holster shop in Twin Falls where he recalls seeing the employees working with the leather, hand tools, and equipment on a daily basis. He thought that they were the most privileged folks he had ever seen. It wasn’t long before his dream of becoming one of the employees at the holster shop came true. With this experience, he later was able to work at two different leather shops in Boise while he attended Boise State University. After spending time as a trapper, hunting guide, packer, and farm worker, he eventually found his way to a saddlemaking school in Spokane, Washington. Schwarz built his first saddle in the fall of 1982. The journey to become a top notch saddler has led him to seek out some of the West’s most respected craftsmen in order to continue learning. 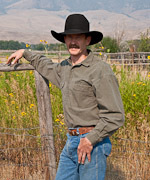 Schwarz is a founding member of the Traditional Cowboy Arts Association (1998). His work was selected as the Best of Show at the Trappings of Texas, and he received the Academy of Western Artists saddlemaker of the year award in 2009. Most recently (2010) he was chosen for the Idaho Governor’s Award for the Arts. Schwarz traveled to France in the spring of 2009 to study old world leather work from a classically trained saddler in Saumur. As he continues his quest of refinement, he has also found time to teach. Once or twice a year he hosts a clinic where he passes on what he has learned about saddlemaking and flower carving. Schwarz believes that the best saddles made are a successful blend of function and art.